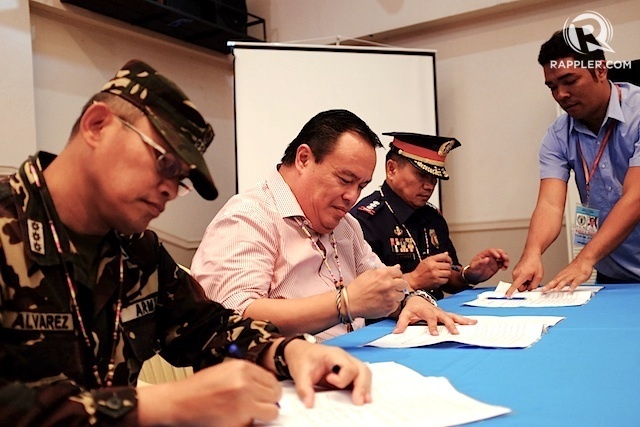 CAMP EVANGELISTA, Cagayan de Oro City, Feb. 10 — The provincial government of Camiguin Island signed a memorandum of agreement declaring the province as Peaceful and Ready for Further Development in a ceremony held at the Provincial Capitol, Camiguin Island at 10:00 a.m. today, February 10, 2015. Col Jesse A Alvarez, commander of 403rd Infantry Brigade and PSSupt Wilfredo P. Cayat, provincial director of Camiguin Provincial Police Office, jointly recommended to the Provincial Peace and Order Council (PPOC) of Camiguin Island that the province is peaceful and ready for further development. Just like the situation of province of Dinagat Islands in Caraga Region, Camiguin was considered insurgency-free based on the following parameters: There has been no influence of the CPP-NPA; No record of terrorist and New People’s Army (NPA) initiated violent incidents; Criminal activities are manageable by the Philippine National Police (PNP); and the province has noted positive indicators of improved delivery of social services in its rural areas, such as health services and wider reach of Justice, as articulated before the PPOC. Major General Oscar T Lactao, commander of 4th Infantry Division said the future is very bright for Camiguin. With the declaration of Camiguin as a peaceful and ready for further development province, we could expect that this province would be a leader in ecotourism. We expect that more investments and tourists would flock to Camiguin. Lieutenant General Aurelio Baladad AFP, commander of the Eastern Mindanao Command, AFP said in the implementation of our present campaign plan, internal peace and security plan or IPSP BAYANIHAN, not only the Armed Forces of the Philippines, the local government and other government agencies are called for to join hands to win the peace.